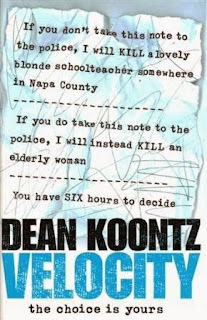 I seem to remember that Velocity was another of those book that I bought whilst at my grandparents' house over the summer. I'm beginning to notice that an alarming number of my murder mystery books have been purchased there and I am a little worried that that pattern in particular should even emerge. In any case, I purchased this largely because the premise was simple, but really intriguing. 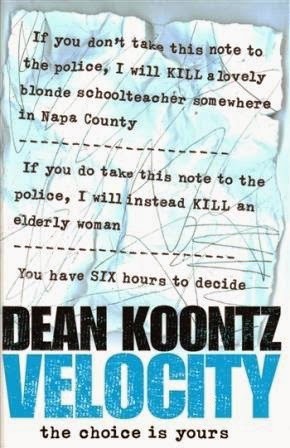 Having now read some of Dean Koontz's work before now, I was pretty sure that I was going to like Velocity, but my instincts have been proved terribly wrong before. "If you don't take this note to the police and get them involved, I will kill a lovely blond schoolteacher somewhere in Napa County. If you do take this note to the police, I will instead kill an elderly woman active in charity work, You have six hours to decide. The choice is yours." At first, he assumes that the note is just a sick joke, but when he hears the next day that a teacher has indeed been brutally killed, he finds himself caught in a contest of wills as more notes come in, with the deadlines and conditions only becoming more dire as time goes on. This was nothing if not a page turner. The situation that Billy finds himself in is fascinating in a morbid way, like watching a car crash unfold. The killer that he faces is devious, consistently several steps ahead of Billy and utterly ruthless. The situation is only compounded by the fact that Billy's unconscious withdrawal from the world ever since his fiancee fell into a coma means that he has almost no friends to rely on and an uncomfortably long list of people that he now wishes he could definitively rule out as a suspect. Occasionally there were plot holes that gave me pause for thought, and a fair few of them aren't really addressed by the end. But really, when the plot goes by at such a breakneck pace that you don't really have time to consider them in great detail. It's mainly through hindsight that they became more apparent. I only have two main issues with Velocity. The first is that there is obviously a lot of suspense built up towards the final meeting between Billy and the killer that has spent several days tormenting him non-stop, and the actual ending felt a bit underwhelming in comparison to the tense events that have gone on before. Admittedly there are still some nice twists in there and it does make sense as an ending, but it still felt a little disappointing. The second thing that bothered me is that some of the quieter moments felt out of place. For example, there's a point where Billy visits a co-worker, to find out why she's been visiting his comatose fiancee. Having explained why she was there, they have this really weird conversation where events briefly threaten to turn occult, only for him to leave and there is never any hint of the supernatural thrown about again. Additionally, Koontz feels the need to sometimes overwork the clues that are gathered during these quiet moments; there are only so many times that you can contemplate the murders as a performance before the line begins to get stale.